Fungible or Great? What’s Your City’s Goal? We all know what draws people to a place. 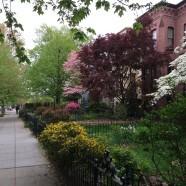 Unique settings, historic districts, beautiful streets and parks. Places that cajole you and make you want get out of your car and explore. They can be invigorating and exciting, or beautiful and serene. Either way, they encourage discovery and leave you wanting more. Inevitably, these are places of civic pride, proudly displayed on post cards and visitor’s bureau publications. Unfortunately, our modern system of zoning often prevents us from building the very things that our visitor’s bureau would love to celebrate. Our zoning code ensures that we create great places for cars—but makes few allowances for the types of places that make communities proud. Buildings must be set back far from the street. Every development must provide an absurd amount of parking. 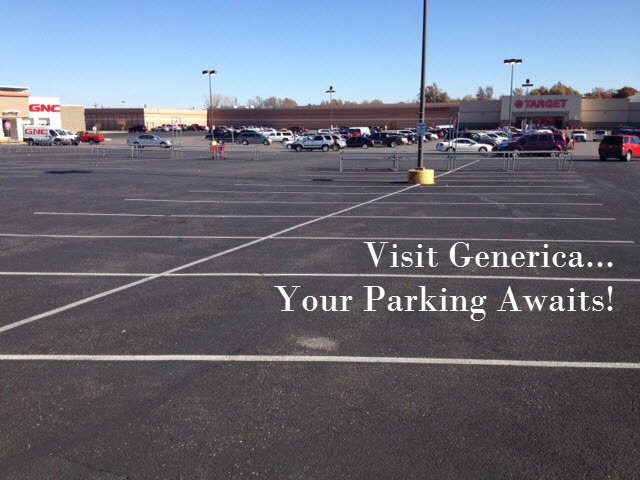 The width of driveway aisles and the size of parking spaces are immutable. Meanwhile, pedestrian amenities are optional afterthoughts. Oh, look! An awning. That’s adorable. Call the Visitor’s Bureau and tell them to bring a camera! Over the course of decades, our zoning codes have created the perfect habitat for car-oriented national chains. And our reliance on sales tax makes city officials reluctant to demand something better from developers. Any proposal, no matter how generic or disposable, is greeted with enthusiastic approval when a municipality’s fate rests upon retail receipts. Unfortunately, it’s hard to market your city, when all that growth adds nothing special to the place. But what’s the long game? 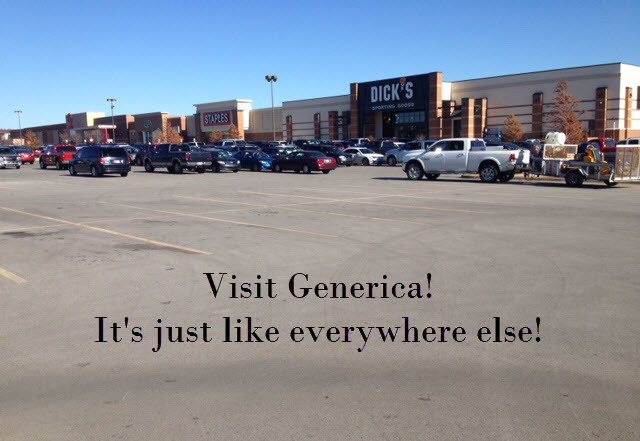 Do we want to live in Generica? Do we really need all those national chains? Is our city’s goal to be redundant, offering only those things which can be found along any Interstate corridor in the nation? 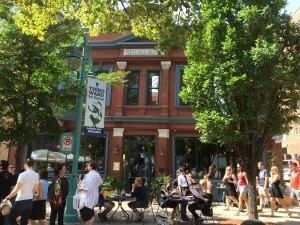 Or do we want to create places of lasting quality that build long-term community wealth? Because if we want our city to be valued, we need to focus on what makes it unique and sets us apart. It’s such an obvious fact, it’s amazing that we manage to ignore it every day.